Nails can claw, cut and tear. They can be used as a practical device for scratching, opening small fasteners and picking up objects. They also protect the tips of fingers and seem to be indispensable for the finger pad sensitivity. In ancient times, nails served both as useful tools and a means of defence. Later, they took on a cultural connotation as in the grotesquely long fingernails of Chinese mandarins. The nail is a flexible plate of horny tissue, made up of keratin, i.e. epidermic cells formed in the root of the nail and hardened. Various factors influence the development of this keratin sheet, the largest in the human body : its genetic composition, nutrition, health (nail state is its best reflection), environment, etc. Besides keratin, there are highly moderated concentrations of mineral salts, such as sulphur, selenium, calcium and potassium. The Matrix is the living portion found at the base of the nail. This is where new cells develop and push the old, "dead" cells forward to form the nail plate. The quality and health of these cells determine the general condition of the nail as it grows beyond the matrix. Everything that happens to the human body can impact nails, in particular the aftereffects of childbirth or illnesses such as high fever, pneumonia, etc. can be translated by furrows that form on the lunula and gradually grow out with the nail. Even psychological shocks can affect the matrix and appear on the surface of the nail as uneven or deep grooves. 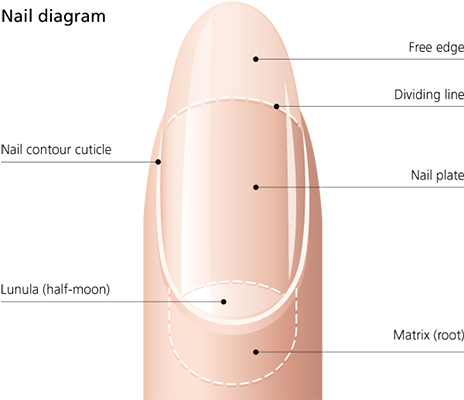 The nail plate is the visible part of the nail from lunula to free edge. It is composed of compressed skeleton cells produced in the matrix and contains no blood or nerves. Normally pale pink in colour, it may become white or bluish depending on temperature and other physical conditions. Although the nail plate seems to be one single piece, it is actually three layers separated by minute amounts of moisture and fat. These layers vary in consistency, the external layer being the hardest and the inner layer, which adheres to the nail bed, the softest. HOW DOES THE NAIL GROW? Healthy Nails and Balanced Diet. Most nail problems can be alleviated through the use of specially formulated MAVALA treatment products.